Not every idea I have is a good one, but every once in a while I stumble on something I think is worth sharing. This concept isn’t rocket science, but it has worked well for us in the stage our high school ministry is in. I think my setting is unique being in a church of 1,000 people. I have shared it before but we are big enough that there is an expectation for excellence and “big church” things, but we are small enough that people still expect the intimacy and relationships of “small church” culture. Every church, size, and ministry has its unique challenges and we the youth pastors still have to figure out how to respond. I decided that I wanted to as best I could, once a year, to have some one-on-one time with as many students as I could. I want to ask how their relationship with their parents is, what God has been teaching them, how their small group is going, where God is taking them as a leader etc. This sounds cool, but lets just say it; your average student won’t make this happen. I can get my student leaders and some others whose parents want me in their life to talk to me, but to have a snapshot of our groups I need to reach the majority. The majority of our Wednesday night audience doesn’t have time, won’t make time, and/or doesn’t think I am cool enough to meet with on top of already attending Wednesday nights, being in a grace group, and serving weekly. The solution is dangling a carrot in front of them to make the meeting worth it. For the last two years I have offered an exclusive t-shirt available only to those who meet with me in these meetings. I am a t-shirt snob so I got out of my way to make these cool. I get a great design from my friend and even budget to print it on a shirt that people will want. Here is this years design. American apparel with the cherry on top of foil printing on the shadow. I put meetings before Wednesdays, after Wednesdays, on Sundays and every day of the week after school. It fills my schedule but it is invaluable to have intimate conversations with that many people and know where they are at, let them know that I value them, and know where they are as it comes to teaching and shepherding the masses. What do you do to make sure you know your entire ministry as well as possible? I work at Grace Church with Kary Oberbrunner. Kary is a great friend, pastor, and author. He has a new book that just came out and I wanted to take a second to let people know about it. Not because you should listen to me, or because my blog is where you find direction in life, but because I believe in his writing and because I am passionate about the subject matter. Here is a quick bio on the book..
Do you know Your Secret Name? Author Kary Oberbrunner believes that until you do, you’ll just keep feeling homesick for a place you’ve never been. The Bible explains that each of us has a Secret Name (Revelation 2:17), but only those who overcome will discover theirs. 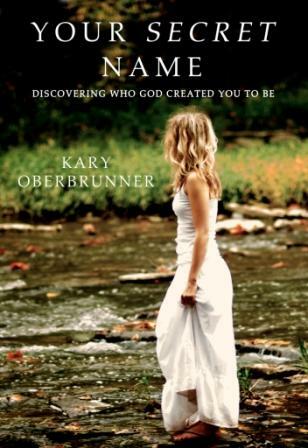 Kary’s new book (September 2010, Zondervan) reveals how you can discover yours and experience life change. Check out the video or take the free test to learn more. Many people are experiencing hope and freedom after reading Your Secret Name. Listen to just some of their Secret Stories. Your Secret Name is a book about identity. Our identity should be found in Christ. Who He has made us and what He has called us to do should direct what we think, how we act, and how we live. Unfortunately many times it doesn’t and we let the world and our past failures, experiences, relationships, etc. decide who we are and our life’s course. I think this is the biggest area that so many people fail in and Christians have wrong. If Christians understood who we are in Christ and what that means we wouldn’t have to spend so much time telling people what to do because their actions would come as a second nature of their identity. I have already seen this book help our church in a worship setting, in outreach, in small groups, in counseling and the impact continues. I speak from experience as someone who has seen friends and people I love ministered to by this book so I would regret if I didn’t share what I consider a great resource and a book God can use in others lives. This blog has been pretty silent over the summer, but never fear I am back. With the school year comes activity and with activity comes my writing. Time for an oldie but a goodie a little Wednesday night mind dump. I can’t go to sleep until I do it, so please bear with me. It was the first HSM Wednesday of the school year. We are doing a series called mixtape. When you make a mix for someone you put all the stuff you want them to hear. We are talking about worship, grow, serve, and outreach. Tonight we tackled John 4 with the big idea “true worship is in spirit and in truth”. Some ups and down in the flow of the night, but all anyone will remember is this video. It was the hit of the night. Our team did a great job building atmosphere in the room. Speaking of the room, we have one of the nicest student facilities I know, but in the summer we had to go back to the drawing board. The room is now 3 years old and we are seeing wear and tear and having to make updates as the way we use the room has morphed from when the plans were drawn up in 2003. Our sitting areas have always been kind of corporate and we have tried to make them into actual living rooms with lamps, etc. We use a new area off the game room for our Prayer patio and have some lantern lights and candles to make that a room where people want to go. We updated lots of tech stuff, and by we I mean Josh Howard did all the work as the greatest summer intern of all time. We hung speakers in the game room so the sound is more balanced and also in the future might have that function as a stand alone system when the room is divided. We finally have a grip on our lighting and have tons of sweet pre-sets in the moving lights. Josh also added some back stage lights that will be behind the band and give some great new effects. I just talked about our room a lot, I hope that doesn’t make me shallow, but I do believe great environments can really contribute to students worship. I am noticing a real change in my view of student ministry in the last year as I get older. I feel very free of the expectations I put on myself in the past and comfortable with God doing what he wants to do. I don’t feel as pressure to please everyone or attract everyone. If anything I want to raise the standards we call and hold people too. We incorporated a ton of videos tonight and our computer could not handle it. Is it too much to ask a computer to play a video? I don’t think so. Its good to be back. I will end this now so I have more to rant about on future Wednesdays.